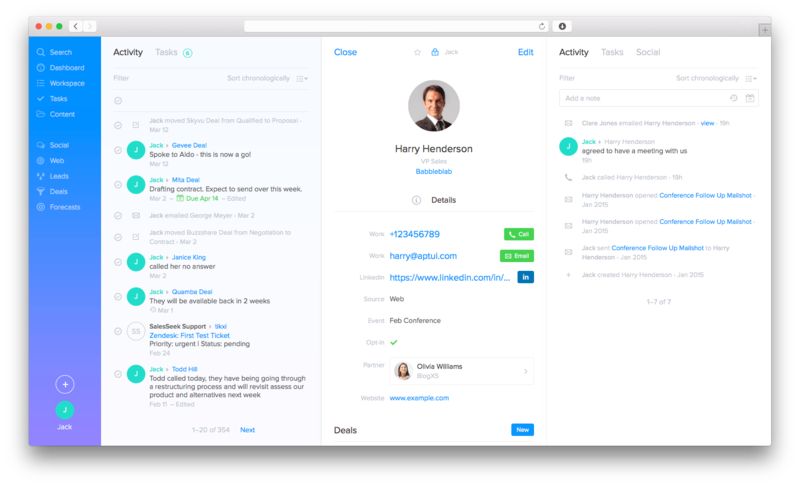 SalesSeek, a London technology company, makes an eponymous Software-as-a-Service (SaaS) product for sales and marketing operations at growth-focused technology businesses. SalesSeek combines the functionality of customer relationship management with marketing automation to create a single, design-led platform that helps companies reach new customers and close more deals. SalesSeek includes features for contract and deal management, email marketing, sales forecasting, social monitoring, and even website analytics — helping you uncover trends and have deeper insight into buyer behavior. They even offer role-specific dashboards for CEOs, sales managers, marketing teams, telesales specialists, and traditional sales representatives, ensuring everyone has the actionable information they need to make the best decisions. Furthermore, SalesSeek’s open API will allow you to integrate it easily with your existing tools, meaning it adapts to your workflow instead of making you change your existing processes. All functionality is included in the base price, making SalesSeek a much better value proposition than comparable modular systems that charge you for each feature separately. Not sure if SalesSeek’s CRM / Marketing Automation platform is the best fit for your company’s needs? See more options in our CRM Product Selection Tool, or if you’d prefer, call, click, or email to speak with an unbiased Technology Advisor today for a free consultation on your unique requirements. Learn everything you need to know about SalesSeek. Our experts will reach out to you shortly.